Quinoa Black Bean Veggie Burgers piled high with all your favorite toppings! 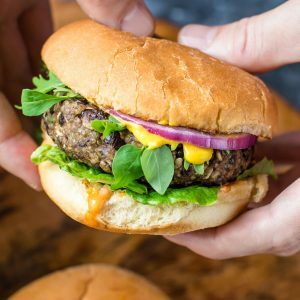 These easy peasy burgers are vegetarian with super simple gluten-free and vegan options below. Let's get our veggie burger on! Craving cheese? Pepper Jack slices are awesome with this tasty veggie burger! Bring a medium saucepan to high heat, add your quinoa and water, and bring to a boil. Once boiling, reduce heat to low and simmer, covered for 12-13 minutes or until quinoa is fluffy and the liquid has been absorbed. Once done, fluff and set aside. While the quinoa cooks, prep your veggies! Drain and rinse your black beans and finely chop or mince your veggies. In a large bowl, fork mash your black beans until almost paste-like, leaving a few chunks and some whole black beans for texture. Process oats in a food processor until they resemble an oat flour. This step is optional (you can totally use whole oats) but the burgers hold together way better with oat flour. Add quinoa, oat flour, red onion, green onion, jalapeño, garlic, cumin, salt, garlic powder, oregano, cayenne pepper to the black beans. Add your egg or flax egg and mix with a fork or your hands. Divide mixture into four portions and roll into balls. To shape your burgers, cup each ball in your hands and squeeze tightly, rotating as you gently, but firmly, press it into a disc using your thumb. I like mine on the thiner side so middles cook all the way through, but not so thin that they won't hold their shape. To help the burgers set, cover and refrigerate as you prep your buns and toppings. This will give them a little while to set. You can even leave them overnight and cook them up the following day. I often make one after 15-30 minutes of chill time and cook up the rest the following day. For the Sriracha mayo, combine mayonnaise with as much chili sauce as your heart desires. Yum! Cook for a few minutes on each side until you're left with a golden crust. and a warm center. Repeat for each burger, or cook two at once if you have a big enough pan! I'd skip crowding all four together just because they're a pain to flip when all up in eachother's business. A tip for perfectly shaped veggie burgers: While sizzling away in the skillet, I nudge the burgers with the backside of my spatula to gently help form the sides into a perfect disc. Works like a charm! Slather your buns with Sriracha mayo and yellow mustard, pile them high with lettuce, and top each burger patty with any and all of your favorite burger toppings. You can even lightly toast the buns on the pan after you cook your veggie burgers! Simply cook the burgers per instructions above, allow to cool a bit, and then freeze [spaced] on a plate or cookie sheet. Once they've had a chance to partially freeze you can wrap them individually and pile them in baggies or your favorite airtight container for fast food without the freaky ingredients. To re-heat, simply pop on a baking sheet in the oven for about 18-20 minutes at 400 F. Enjoy! Nutrition Facts are an estimate gathered using an online recipe nutrition calculator. Values calculated for the veggie burger patties.